It will represent cross point for different tehnologies. It can be used for testing, simulation and production. Inspired from and for the Mobi Grand Challenge. Goal is to make a mobility platform what will represent the point where different technologies can intersect. It can be used for testing, simulation and production. First stage is to confirm the desired interaction between different technologies. Ethereum smart contracts, where are all the rules and all users stored and ready for interaction. 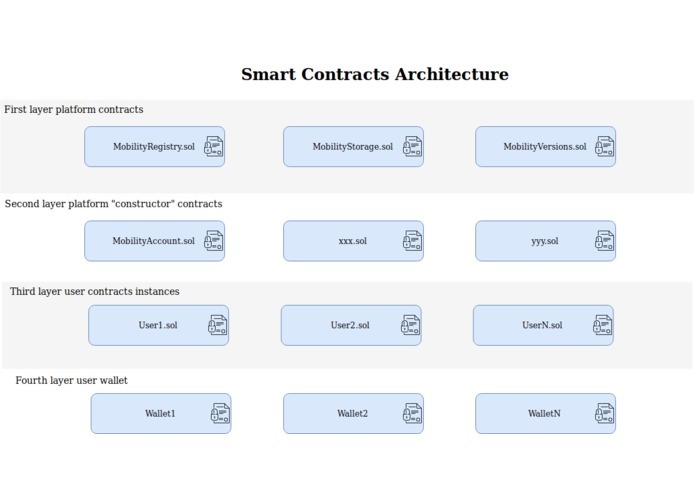 In the first layer are the contracts that set the rules for the platform and store the data. Functional part and storage part are separated, so if there is a need for a critical functionality update of the platform, only MobilityRegistry.sol is updated and with the consensus the address of the new version of the contract is pushed and stored in the MobilityStorage.sol. MobilityVersions stores addresses of updated MobilityRegistry.sol contracts, so DApps can ask for the address of the latest version. Here are the instances of the deployed accounts. Owner is the wallet that created the instance with the MobilityRegistry contract. Different DApps interact with specific account through this instance contract. Founds that collects on the contract with doing transportation service, can be transferred at any time to any wallet only by the owner of the contract instance. Ethereum wallets are used for interaction with the deployed smart contracts and for the transferring ether (paying) to the MobilityAccount smart contract that will do (or is done) the transportation service for us. Every contract has the function ownerRetriveDonations(address receiver), that can be executed at any time by the owner of the contract (the wallet that was used for creating the contract instance). For the monetization testing was implemented functionality in the MobilityAccount that sends received_amount/10 to the MobilityStorage contract, the rest stays on the MobilityAccount contract instance. At the moment the amount the price for transportation request is hard coded in the MobilityAccount contract (0.01 ether/km). But can be upgraded that can be changed by the owner of the contract instance. ** If there is a platform desire to have a very small percentage income from the transactions, than upgrade is needed. Because of the immutability reasons, receiving function must be implemented in the first layer contract, which forwards calculated amount to the MobilityAccount contract instance. Enter destination and from available offers pick the one that is fastest or cheapest. This can be different logistic application that needs transfers of any kind of goods. Probably MobilityAccount contract must be upgraded in some way that transporter stakes some ether, which is released back to him when specific rules are satisfied. Use application in the mode where the app listens to the published transportation requests. The app automatically response with the distance and the price. If you get chosen, do the transportation service. Long term goal is to have only autonomous vehicles in the transportation services. But in reality there will be a symbiosis between our cars and fully autonomous cars. And the app can help us to build the next generation transportation services and optimized travel routes (with the help of AI and IoT for smart traffic lights). Besides the offer of the transportation services is also idea to have optimized navigation systems that we are already using it. 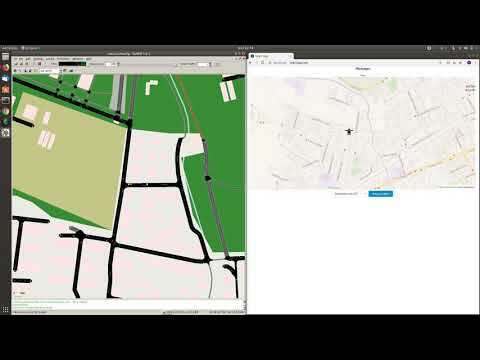 Application can be used for connecting autonomous vehicles with the mobility platform. Vehicle can get route request, send the command to the navigation system, pick up a passenger or some item, do payment request and automatically when the payment is done finish the transportation service. SUMO is an open source, highly portable, microscopic and continuous traffic simulation package designed to handle large road networks. It is mainly developed by employees of the Institute of Transportation Systems at the German Aerospace Center. SUMO is open source, licensed under the EPLv2. 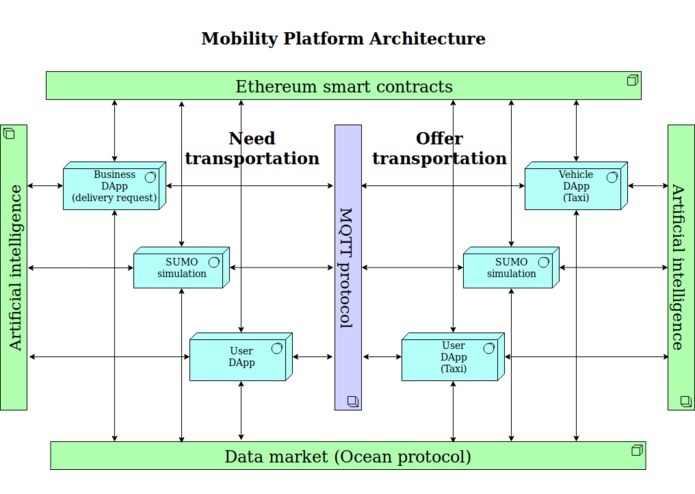 Sumo was chosen because of quick testing and quick evaluation of developed mobility platform features (on application layer and blockchain layer). In that way automated testing can be developed. It also supports any desired city plan import. For the demonstration I imported a map of Ljubljana, the capital of Slovenia. You can define speed of simulation, custom or repeatable vehicle trips. Additionally the simulation can be use for producing a lot of traffic data that is needed by the sophisticated AI and machine learning tools, for traffic optimization. It is ideal for publishing location data with high frequency. As such it was also used as a communication mechanism of DApps, for publishing requests or responses and listening for requests and responses. As it is publish/subscribe based, there is no need for some database with all DApps users. Requirements are that DApp must follow topic creating rules. For example, all requests for specific city based are published to the topic: "req/country_name/city_name" (e.g. "req/slovenia/ljubljana). So DApp of the transporter subscribes to the topic "req/country_name/city_name/#" (# is multi-level wild card, so can be also used like "req/country_name/#" for offering transportation across whole country). Idea is to offer and make a test polygon with the traffic simulation tool. Make a platform layer for developing different AI based optimization algorithms, that can be used for example to optimize traffic. Development can start with implementing open-source tool Flow. Flow is a traffic control benchmarking framework. It provides a suite of traffic control scenarios (benchmarks), tools for designing custom traffic scenarios, and integration with deep reinforcement learning and traffic microsimulation libraries. Retrieved from (https://flow-project.github.io/index.html). Ocean Protocol is an ecosystem for sharing data and services. It provides a tokenized service layer that exposes data, storage, compute and algorithms for consumption with a set of deterministic proofs on availability and integrity that serve as verifiable service agreements. There is staking on services to signal quality, reputation and ward against Sybil Attacks. Ocean Protocol helps to unlock data, particularly for AI. It is designed for scale and uses blockchain technology that allows data to be shared and sold in a safe, secure and transparent manner. The fastest way to try out the whole package is with the help of Docker, because there are many different tools used with the platform (many dependencies). Docker runs processes in isolated containers. A container is a process which runs on a host. When an operator executes docker run, the container process that runs is isolated in that it has its own file system, its own networking, and its own isolated process tree separate from the host. It is available for Linux and Windows, but as we start the simulation, GUI is opened and for display sharing in Windows, there are some additional X Server installation required that I will not cover here. On your local machine open previously created file "Dockerfile"
In the web application, if you click on "Request a Ride! ", nothing happens. This is because there is no clients (taxi drivers) connected to the platform. That is why, we will run the simulation, where we will simulate the taxi drivers. Now, in the terminal you see something like: user@container_id:/home/mobi/mobi$, that means you are in a running container. 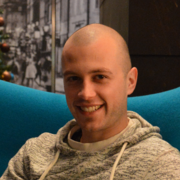 Please send me a mail on za.primoz@gmail.com, and I will send you back the password. I did not want to hard code it, because the repository is public. Write the password and press "Enter". Now if you move back to the web app, and if you click on "Request a Ride!". You get back a list of available taxi drivers in the form "taxi_name: duration_from_taxi_location_to_you_plus_to_final_destination"
It takes a couple of seconds and the transaction is confirmed. Simulation also sends a message to the web app, with the payment details. If you are using MetaMask, notification appears. Again it takes a couple of seconds, and when the taxi receives the payment, transportation begins. If you have troubles setting up the environment and you are more used to Virtual machine like VirtualBox, than contact me and I will set one up for you. Here is a video of testing the application.